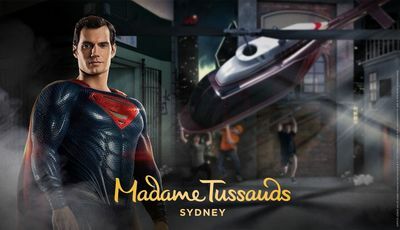 Madame Tussauds seeks Australia's biggest Superman/Batman Fan to attend the Justice League Experience Launch Party in Sydney! Is your child Australia's biggest Superman / Batman Fan? To celebrate the launch of the world-first Justice League Experience at Madame Tussauds Sydney, the Darling Harbour attraction has launched a NATIONWIDE search for the biggest superhero fans. Two winners along with their guardian or friend will be flown to Sydney to be the first to meet their idols at the exclusive launch party of the epic, new experience on Thursday 28 June. Winners get to stay overnight at the Hyatt Regency Sydney. This nationwide search is open to superheroes of all ages. Put your case forward with a video or a series of photos, accompanied with a written response to the question: "What makes you Australia’s biggest Superman/Batman fan?" Upload your entry to Facebook or Instagram, tagging the Madame Tussauds Sydney pages and either #SupermanLeague or #BatmanLeague for a chance to win the ultimate Superhero title! For full competition terms and conditions, tickets and more information, go to www.madametussauds.com.au or follow Madame Tussauds Sydney on Facebook or Instagram. The Justice League: Call for Superheros experience at the Sydney attraction opens on Saturday 30 June. Featuring an all-star cast of DC Super Heroes in an action-packed adventure unlike any other, this exhibition invites guests to star alongside Justice League’s Gal Gadot as Wonder Woman, Henry Cavill as Superman, Ben Affleck as Batman, and Ezra Miller as The Flash. Is your child Australia's biggest Superman/Batman Fan?.